Rosie Hardy is photographer based in the UK. She is known for her portraits that dig into surreal concepts, and recently, for being the photographer behind Maroon 5′s upcoming full-length’s album cover. She is also a very successful teacher and has her own workshops she takes to different cities around the UK. Rosie Hardy's surreal, female-focused photography is described as being able to let your mind wander into a world of curiosity and wonder. 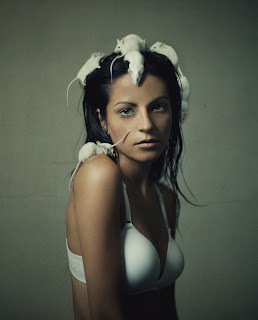 The varied images of women in both seemingly normal and quite bizarre situations are amazing. Her photographs have been described as marvelously eery, and photo enhanced. The image of the reflection of the women through glass is what first interested me in Rosie's work. As a continuation of my previous project, I have been looking into taking picture of people through glass, and cages instead of animals to emphasize the interspecies connect between humans and animals. I found that some of her other work incorporated the idea of human and animal connection or human to nature connections.